– Drama series haven’t fared well for him, but maybe Christian Slater will have better luck with his big-screen-to-TV ambitions as the star of Fox’s untitled fall comedy pilot about a team of security-cracking twentysomethings. – Fox invited Conan O’Brien to take part in the Idol Gives Back charity special that airs April 21 on Fox, but NBC refused to give O’Brien a pass to make the non-NBC appearance. Lame. Still, the invitation suggests Fox is trying to build a relationship with the star of its potential new late-night franchise. – BTW, for a shot at winning tix to one of O’Brien’s sold out comedy tour shows, hit Twitter. – Great idea: Comedian and Parks and Recreation co-star Aziz Ansari will host the MTV Movie Awards on June 6. 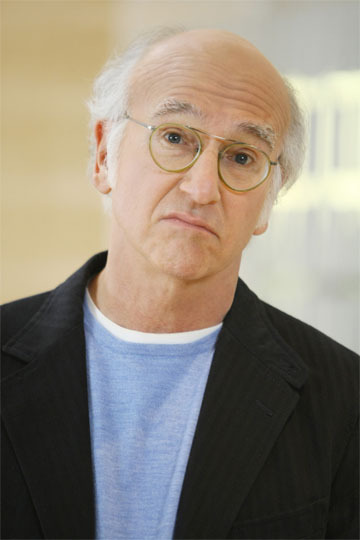 – No need to wait for the next Curb Your Enthusiasm DVD release to get bonus features: Larry David is producing a series of featurettes that will include guest stars and pundits dissecting the moral implications of each episode of Curb when the show begins airing on the TV Guide Network this summer (June 2, to be exact). – EW.com has details on a casting notice that makes it seem like this will be the final season of 24. – Yay: Days of Our Lives has been renewed through the 2010-11 season. But the bad news: rumor has it that long-time DOOL star, and half of the Bo and Hope supercouple, Peter Reckell, has been let go from the soap. – Starz, led by former HBO honcho Chris Albrecht, is forging ahead with plans to become a real destination for original programming with the development of a new drama that will put a modern spin on the story of Camelot (the Arthurian legend, not the JFK one). – If your NCAA hoops bracket isn’t going so well, check out The Late Show‘s Stupid Pet Tricks bracket/competition (and enter for a chance to win a trip to New York City and see David Letterman‘s show live). – Rosie O’Donnell is planning to launch a new daytime TV talk show in 2011, just as Oprah‘s daily show ends. Rosie’s gotten wackier and wackier since her days on The View, and her old daily talk show, so it’ll be interesting to see if she can still draw a big audience to TV every day. – Glee, on Broadway? Makes perfect sense to me. – Betty White is coming back to primetime full-time, and, more good news, about another classic TV star: Tom Selleck is in final negotiations to lead CBS’ fall cop drama pilot, in which he would star as the chief of the NYPD, and Donnie Wahlberg would play his son, an NYPD detective. Awesome. – And My Name Is Earl dad Beau Bridges will be Jim Rockford’s (Dermot Mulroney) dad on CBS’ Rockford Files remake. – Among the stars of Bravo’s upcoming The Real Housewives of Beverly Hills spin-off: Kelsey Grammer‘s wife Camille and two of Paris Hilton‘s aunts, including Escape to Witch Mountain star (and guest star of a memorable Little House on the Prairie episode) Kim Richards. – The last time Oprah went on trial, the end result was that Dr. Phil was unleashed on the world. Let’s hope things turn out better this time. – Among the new shows SyFy announced at the network’s upfront presentation last week: a cooking show, a magic show and a reality series about special effects make-up artists. – What every Jersey Shore fan needs on his or her desk: A talking bobblehead version of Snooki, The Situation or DJ Pauly D.
– Paula Abdul has officially turned down the offer to host an ABC revamp of Star Search, making it seem even more likely that she’s holding out for a spot on Simon Cowell‘s U.S. version of X Factory. – And, at last, someone else who feels the way I do about The Middle. I like Modern Family a lot, but I love The Middle.